Ringworm is an infection caused by one of a group of fungal parasites (dermatophytes) that affect the skin. Dermatophytes thrive in warm, moist places and live on keratin, a protein found in dead skin, nails, and hair cells. These fungal infections are called tinea infections, and they are named for the area of the body involved. The most common are tinea capitis (scalp), tinea corporis (body), tinea cruris (groin), tinea pedis (feet), and tinea unguium (nails). Tinea infections have different characteristics, and treatment depends on the area of the body affected. The seriousness of the infection depends on the body’s reaction to the fungal invasion and can range from mild reddish patches to intensely itchy, peeling skin and secondary bacterial infections. Conditions that increase the risk of infections include scrapes or cuts in the skin, high heat and humidity, perspiration, shoes that do not allow air circulation, use of hair oils, and diabetes or immunosuppressive conditions such as AIDS. Ringworm of the scalp mainly afflicts school-aged children. It is contagious but treatable with oral antifungal medications. Most patients have flaking of the scalp, broken hair and areas of no hair, inflammation, and in serious cases, a sore, swollen, reddish patch of scalp known as kerion, which can lead to permanent hair loss. Since this form of tinea is contagious, antifungal shampoos are often recommended for use by the entire family during treatment. The most common ringworm (tinea) infections are tinea capitis (scalp), tinea corporis (body), (feet), and tinea unguium (nails). Tinea infections have different characteristics and treatments depending on the area of the body they affect. Most ringworm infections are spread by direct contact with someone who has a fungal infection, or less often by contact with items contaminated by fungi such as towels, brushes, or shoes. Contaminated soil is also a cause. Some of these fungi can cause infections in animals, which in turn may transmit the infection to humans. The symptoms of ringworm infections (in medical terms, tinea infections) depend on their location, but fungal invasion of the skin or nails can cause intense itching, scaling, or a reddish patch, often circular, which clears up in the center, first leaving a red ring around the area (this accounts for the name “ringworm,” which is not caused by a worm at all). Tinea of the scalp may result in scaling that appears to be dandruff, hair breakage near the scalp, called a “black dot” appearance, or in more serious cases, a swollen area of the scalp known as a kerion. Tinea of the nails can result in yellow, discolored, crumbled, chipped, or separated nails. Making the Diagnosis: Since so many other skin conditions look similar to tinea infections, it is important to have the diagnosis confirmed before beginning treatment. The diagnosis is often clear from the appearance of the skin or nails. The presence of a dermatophyte can be confirmed by looking at scrapings of the skin or nails under a microscope, although the exact type of dermatophyte can be determined only by growing the sample on a culture medium. Some species of fungi that cause ringworm infections will appear fluorescent in the dark under a blue light from a Wood’s lamp. In general, twice-a-day treatment with antifungal creams, ointments, or lotions is successful. These topical antifungal agents include medications such as clotrimazole, econazole, ketoconazole, miconazole, and terbinafine. In difficult-to-treat cases that do not respond to topical treatment, or in the case of infections of the scalp or nails, oral antifungal medications such as griseofulvin, itraconazole, fluconazole, or terbinafine are indicated. Sometimes both forms of antifungal medications, oral and topical, are used together. Most tinea infections respond to treatment in two to four weeks. If no improvement is seen within two weeks, a doctor should be consulted. It is recommended that topical antifungal medications be continued for two weeks after the infection has cleared to prevent it from returning. In patients with chronic, recurring infections, it may be useful to continue using the topical medications once or twice a week to protect against future infections. Preventing Tinea Infections: Tinea infections occur when transmission, or spread, causes an inflammatory reaction and conditions exist that are right for the fungus to thrive. To prevent infection, it is important to avoid potential sources of transmission. It is also advisable to keep the skin clean and dry. 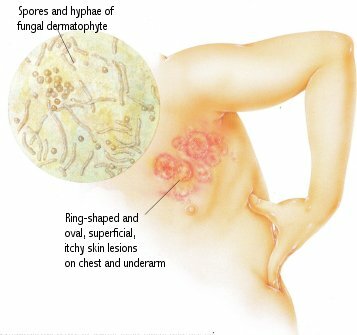 Recurring fungal infections such as jock itch or athlete’s foot can often be controlled by regular use of an antifungal powder or cream. Treatment: Be sure to ask your pharmacist for help in selecting the right medication to treat or prevent tinea infections. If your doctor prescribes an oral medication to control a tinea infection, your pharmacist can also tell you the best way to take your medication to achieve a cure. Oral medications for the treatment of tinea infections can have side effects and drug interactions. Check with your pharmacist to learn more about these medications.